Our company deals with rental boats, water scooters, Flyboards, Jetovators and many other water attractions. Do you want to experience an absolutely unforgettable vacation full of adrenaline? You can get all that with us in one place! You can try all of these experiences on the Croatian island of Pag, which is also called "Croatian Ibiza". When you get enough of adrenaline, let us take you to the famous Zrce beach , the most famous and attractive beach of the whole Adriatic, full of bars, where popular after-beach parties run every day until early morning hours! We will be happy to arrange for you transportation and accommodation in all categories - from local private rooms to 4 star hotels! Experience a vacation you will never forget! 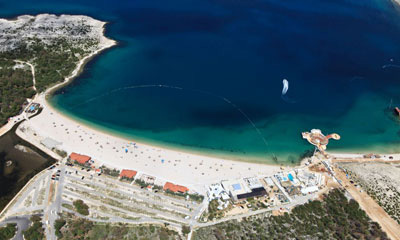 Zrce, a famous pebble beach in Novalja on the island Pag, is the most popular and attractive beach of the whole Adriatic. Thanks to its vibrant nightlife, it is often called "the Croatian Ibiza". The beach is divided into zones for different activities, incl. parts for non-swimmers and children. It is equipped with great facilities: coastal patrol, first aid, restaurants, water slides, rentals of scooters, pedal boats, water skiing, bungee jumping, beach volleyball, billiards, underwater fishing and good sanitary facilities. The beach has a capacity of 7,000 visitors and offers fun 24 hours a day. The most famous clubs you should not miss are Aquarius, Papaya and Kalypso, where domestic and foreign DJs host (e.g. in August 2009, DJ Tiesto and Paul van Dyke). British magazine Mixmag has awarded the Club Aquarius as the most popular place of entertainment in Europe.